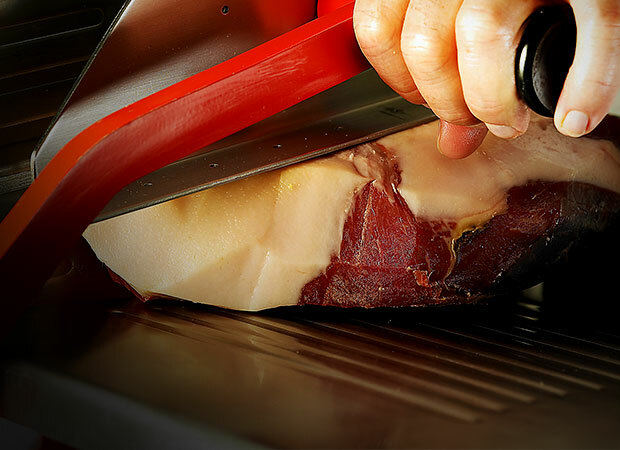 The process of carving Serrano ham (also known as Spanish ham) with a knife requires time, dedication and skill. It is very important to be precise about the thinness and size of the slices in order to achieve the best texture and flavour for this highly-valued delicacy. The Serrano ham carver is the person entrusted with transforming the piece into delicious slices with utmost care: knife-cut ham influences and contributes to the tasting experience. “Exclusive Signature” or brand in the shape of an S and numbered control tag. Since 1990, the Consorcio del Jamón Serrano Español has been the Association uniting the main Serrano ham producers-exporters in Spain. Quality is the fundamental principle of this group. this ham will impress even the most demanding palettes. However, using the following suggestions with a little bit of patience and practice, you too can carve a piece of Serrano ham in the correct way in order to enjoy it properly. In addition, learning the knife-carving techniques will immerse you in centuries-old Spanish tradition. Ham knife: 22-30 cm. Long, thin, flexible blade. Paring knife: 14-22 cm. Wide, rigid blade for derinding and trimming the piece. Boning knife: 13-16 cm. Short, thin blade for getting close to the bone. Knife steel: grinding rod used to smooth the edge of the knife. Tongs: to handle the Serrano ham hygienically and help with carving. In summary: good instruments, a bit of order, craft, art and above all, a good Consorcio Serrano ham. 1. The first step is placing the piece of Serrano ham in the ham holder. With the foot facing up, place the other end of the Serrano ham on the lower pin of the ham holder and tighten the upper part to secure the piece. 2. Once the Serrano ham is well-secured in the ham holder, using a wide-blade knife, start to make a cut approximately 2 cm deep around the foot, just below the hock. 3. Next, start to eliminate the first rind and part of the fat covering the piece of Serrano ham, leaving a minimal layer of fat to avoid the ham drying out. This operation should be repeated as we continue carving. 4. It is important to eliminate the portion of loin covering the hip or bridge bone in the following manner: make three incisions forming a triangle, allowing you to extract the loin portion, revealing the bone of the Serrano ham. 5. Begin cutting the piece at the stifle or contramaza, using the lower part of the hip and the vertex of the “V” cut of the same Serrano ham as a point of reference. 6. Carving must always be completed hip-foot (top-bottom), keeping your hand on the side opposite the cut. 7. As you continue to carve the piece, use the boning knife to “mark” the border of the tailbone to separate the meat from the bone. 8. Finally, we can arrange the slices in order to present the carved product on the plate. 1. 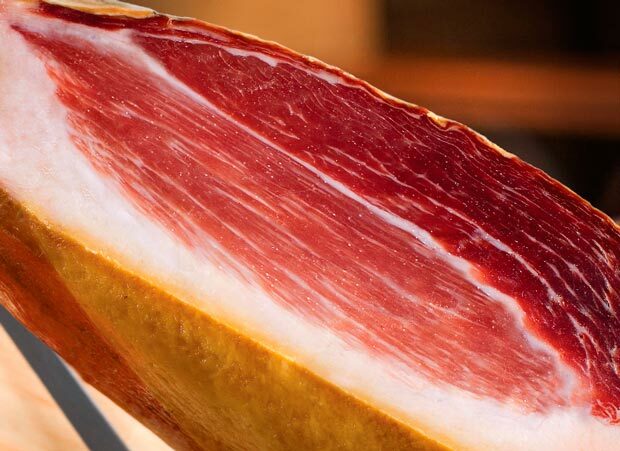 After starting the Serrano ham, once the first cuts have been made, it is recommended to consume the slices in the following 3 or 4 days. 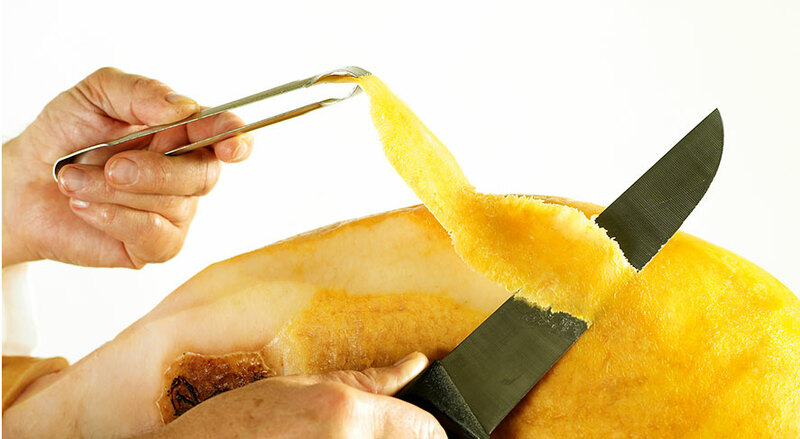 Just remove the rind and fat covering the part you want to eat, but always keep the overall fat layer; at no time will the rest of the fat from the Serrano ham be cleaned and discarded in order to avoid the jam from drying up. 2. 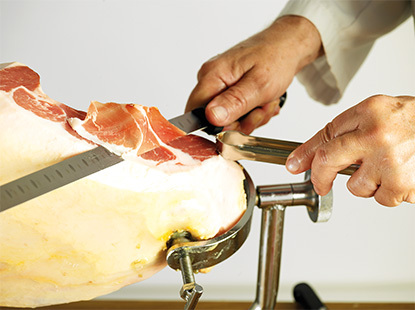 During the cutting process, use one hand to grasp the knife to carve the Serrano ham, while the other will be used to grasp the tongs for picking up the slices of Serrano ham. It is important for this hand to stay out of the carving path. 3. When carving the ham, always go in the direction of the foot to the hip, that is, top to bottom. 4. In order to achieve an authentic taste and enjoy the aroma that envelops Serrano ham, it is recommended to cut the piece into very fine slices with minimal fat. 5. When serving the Serrano ham slices on a plate, avoid overlap between slices. 6. In order to avoid accidents, it is recommended to handle the piece of Serrano ham only once it has been correctly secured to the ham holder. After carving the ham, it is possible that you might find white spots (tyrosine), a while film, or darkened or iridescent areas. More information in the “After Carving” section. Following the Consorcio carving method, one piece of Serrano ham can yield up to 18 plates of contramaza and 47 plates of maza of 80 grams each.